This entry is part 5 of 8 in the series French Guiana. The Réserve Naturelle des Marais de Kaw-Roura is France’s second largest nature reserve and a heaven for bird-watchers and nature lovers. 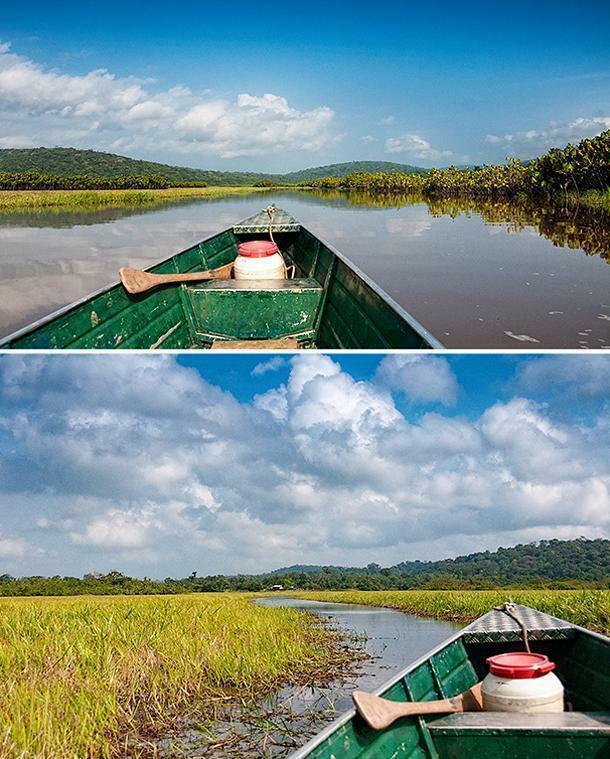 I took a boat into this flooded savannah in French Guiana. 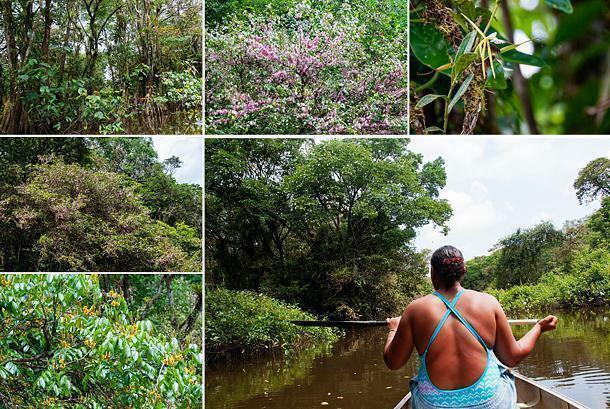 After a week exploring French Guiana, several people asked me an impossible question – ‘What was your favourite activity in Guyane?’ With all of the delicious food, I enjoyed, warm friendly people I met, and surprising experiences I had, how could I possibly choose one favourite? However, put on the spot, one day of my adventure included a bit of everything: great local food; fun, knowledgeable guides; a rare ‘adventure’ sport activity; and incredible wildlife encounters. 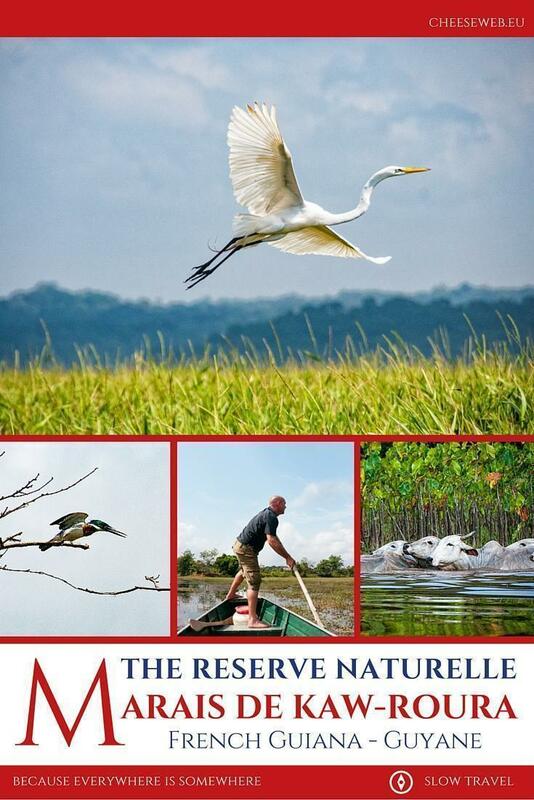 To experience all of this and more, you need to head to the Réserve Naturelle des Marais de Kaw-Roura. 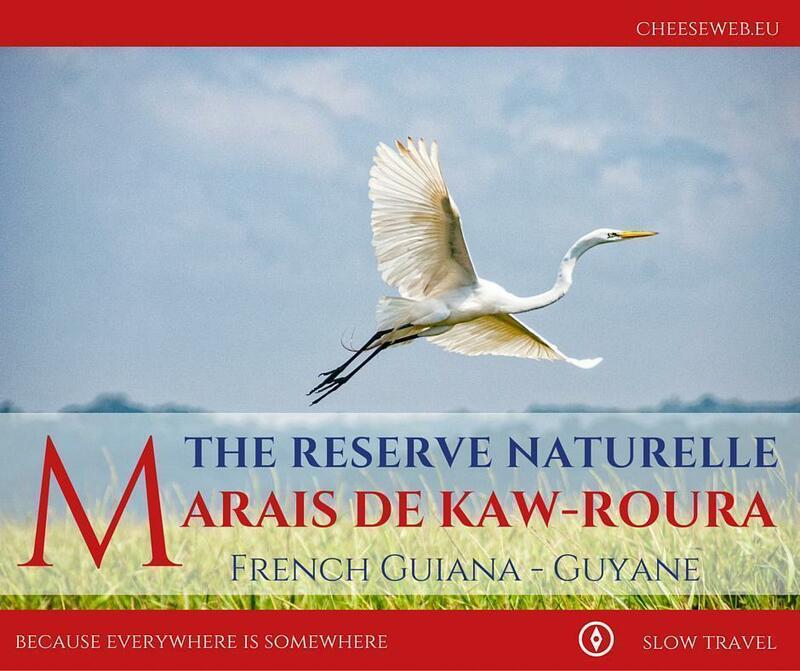 Totalling 94700 ha (365 Miles2), the Réserve Naturelle des Marais de Kaw-Roura is the second largest Natural Reserve in all of France, (keeping in mind, French Guiana is a French Overseas Territory, despite its location in South America.) The area is a haven for all manner of wildlife, particularly birds. That’s why I was up before the sun, joined by my guide from Guyane Tourism, Flavia, and our naturalist guide Stéphane, clambering into a boat on the Kaw River. Andrew and I had visited a number of marshes and waterways on our slow travels through France; from exploring nature on the Loire to discovering the biodiversity of the Clairmarais in Nord-Pas-de-Calais. However, nothing quite prepared me for the Marshes of Kaw-Roura. Perhaps that’s because they aren’t actually marshes as we know them. The Marais de Kaw-Roura is actually a flooded savannah. During the dry season, the water recedes and the grassy plains are revealed. However, as our boat zipped up the river, it was impossible to imagine this watery world as anything other than a wetland. 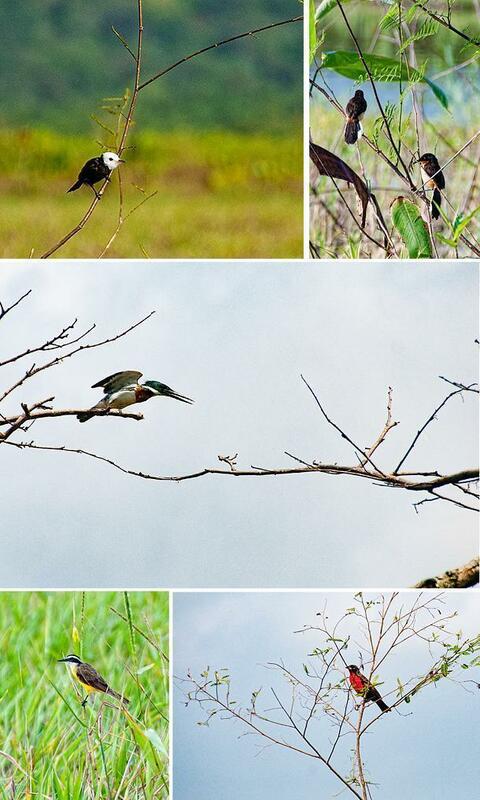 We were surrounded by budding mangrove forests, teeming with vegetation, but also teaming with wildlife. 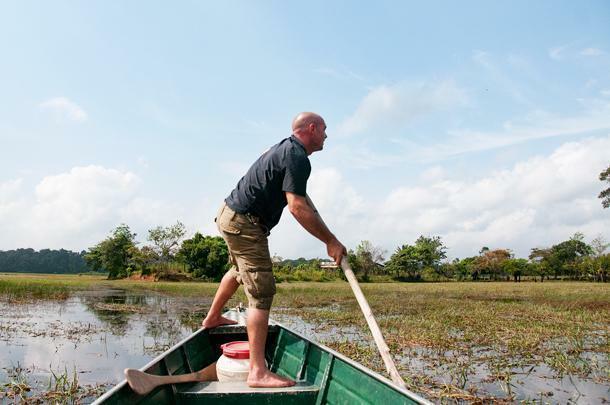 Almost immediately, Stéphane cut the boat’s motor and began pointing out bird species. 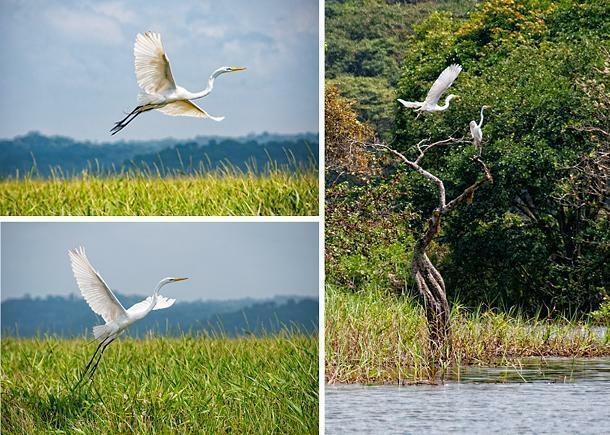 The Marais de Kaw-Roura is a bird-watchers heaven, with 535 species counted in the Kaw region, including numerous varieties of heron, egret, ibis, kingfisher, and even toucans. The species here make of 74% of French Guiana’s bird population. With birds soaring all around our small boat, we slowly cruised past the only working farm still inside the Natural Reserve. 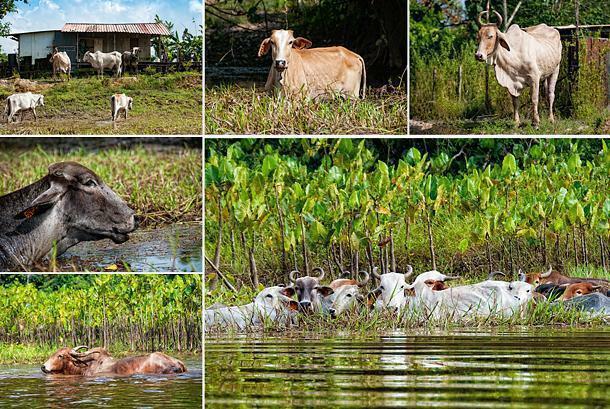 This cattle farm also has an outpost, deeper in the marsh, and we were told to be on the lookout for the unique herd of cattle – but I wasn’t prepared for exactly how unique. These swimming cows (!) are the descendants of Brahman cattle bred with domestic cows. 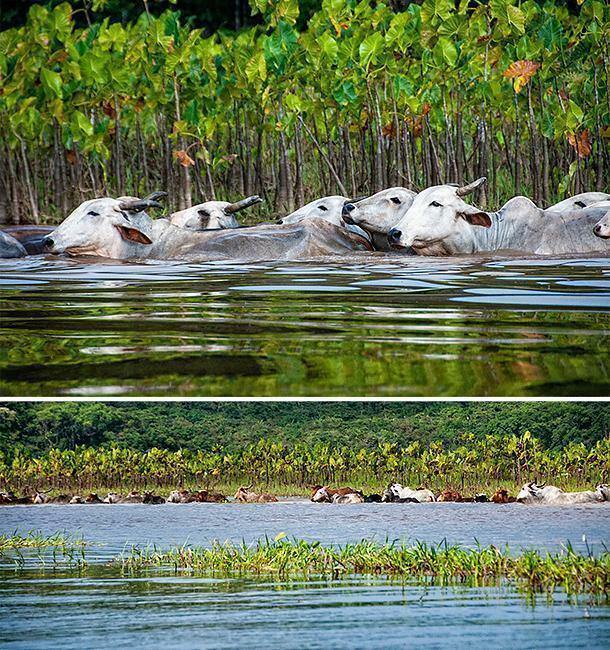 They spend the wet season swimming through the marshes, munching on the succulent vegetation. Watching a creature that is normally lumbering and clumsy on land, glide silently through the water was magical. These are some seriously happy looking cows. They were also very curious about us and approached the boat with inquisitive caution. 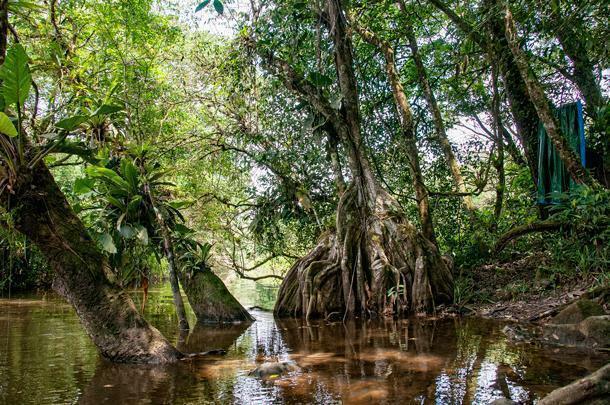 In addition to caiman and other reptiles, it’s possible to spot 98 species of mammal in the reserve, including capybara (the world’s largest rodent, resembling a giant guinea pig), spider monkeys, the giant otter, manatees, and jaguars (the last three all being endangered species.) In fact, the Marais de Kaw contains 54% of French Guiana’s protected species. As we drifted closer to the narrow strip of Amazonian forest included within the reserve’s boundaries, there was one mammal I was desperately hoping to see. “Sloths are very difficult to spot because they stay high up in the canopy,” said Stéphane, dashing my hopes. As we neared the forest, the vegetation began to change. 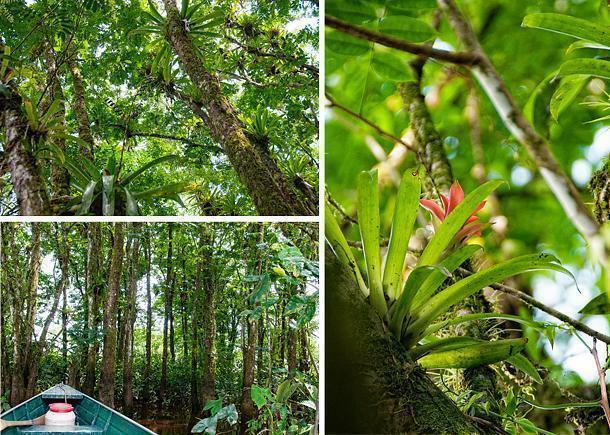 The trees became taller and we were able to spot bromeliads clinging to the branches. A few were even coming into bloom, with brightly coloured flowers. We also spotted unusual nests, hanging from the trees. 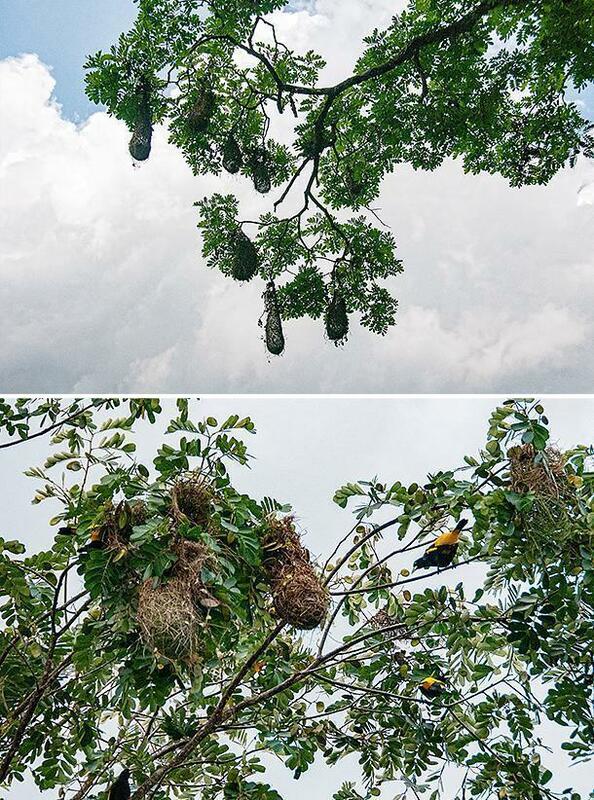 The nests took the shape of clogs and are built by the yellow-rumped cacique. The trees were a riot of noise as the birds competed for the best site within the tree to build their nests. Even zooming in with my longest camera lens, I was forced to take his word for it – until he handed me his high-powered binoculars. Sure enough, I could pick out the face and slow-moving hands of a sloth. Our boat pushed a bit deeper into the forest, and we docked at a small clearing, owned by Tig Dilo. As Stéphane prepared our lunch, he urged us to cool off with a swim. Flavia looked at me with surprise, when I eagerly agreed to join her. When else would I be given the chance to swim in the Amazonian forest? After paddling about for a bit in the refreshing water, we pulled ourselves out over the slippery mud bank. “You know, no other journalist has ever joined me swimming on one of these trips. They are all too afraid,” Flavia informed me. 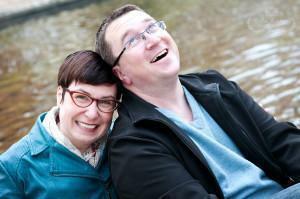 “Well, I guess bloggers just do it better,” I laughed and with that, we tucked into our lunch. 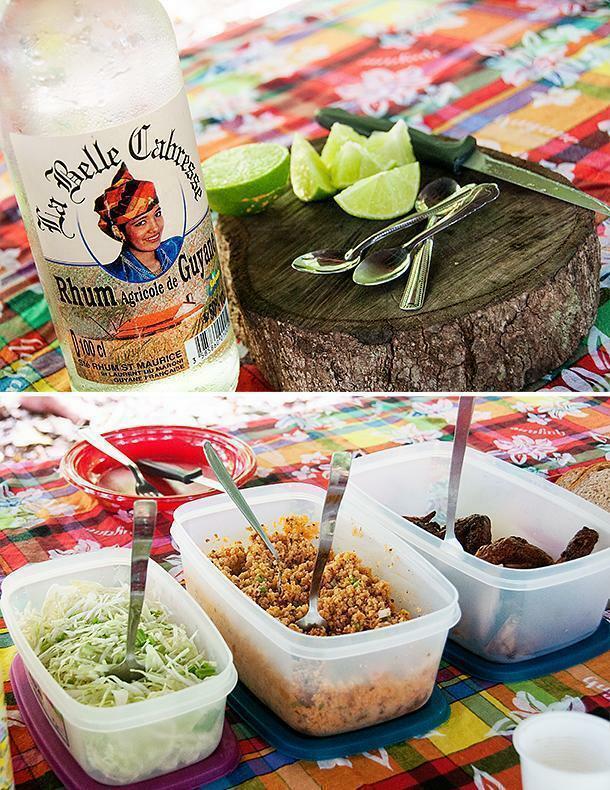 Our picnic was a feast of Guyanese local delicacies: poulet boucané, a salad of couac, and fresh vegetables. Of course, we washed it all down with a generous drink of Ti punch. Perched in the middle, with my camera glued to my face, we glided silently between the towering trees. I can’t think of a better way to explore the rainforest. When we could go no further, we turned around and rejoined our motorboat. We headed back to the dock, with little talking, wrapped up in the sights of the magical flooded savannah. We paused to watch a small herd of cows graze beside the river before returning to our starting point. 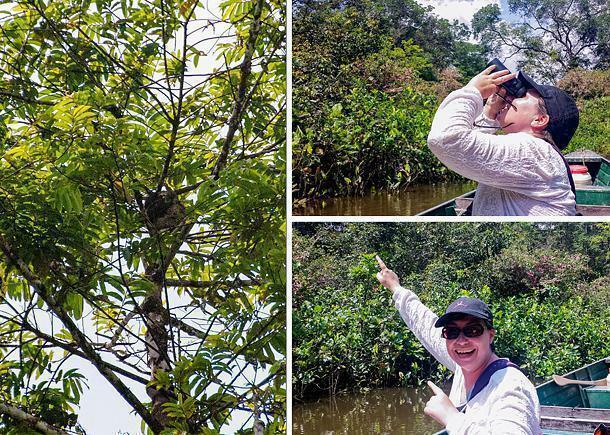 Yes, it’s hard to choose a favourite activity in French Guiana, among all of the incredible experiences I had, but photographing rare birds, spotting my one and only sloth, watching swimming cows, and swimming in the Amazonian forest, make up one unforgettable day. 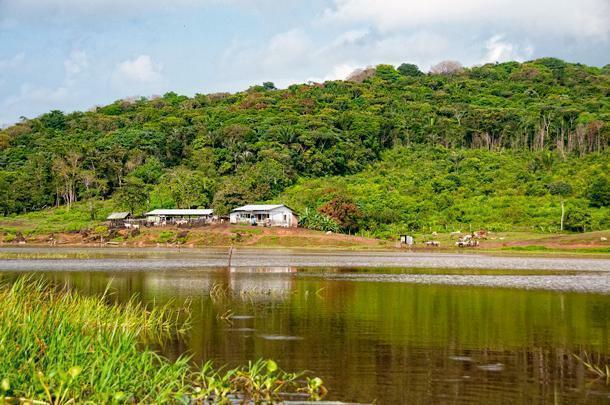 My travel to French Guiana was sponsored by Guyane Tourisme and Atout France Belgium. As always, all opinions remain my own.